This article is mandatory reading for anyone who would like to 3D print, but it does not replace a personal introduction! All of our printers use "fused filament fabrication" (FFF, a.k.a. FDM) and are therefore limited to thermoplastics as materials. Lots of cool things can be made with this technology, but it's good to be aware of the limits of FFF before starting to design your parts. 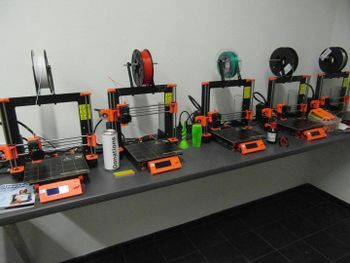 You can find our 3D printer farm in the electronics room. Using the 3D printers, like any other machine, requires a personal introduction - ask a tutor to get one! A 3D model has to be virtually split into its layers ("sliced") before a printer can start building it up layer by layer in reality. You can use Slic3r Prusa Edition with the default settings for the MK2S (or MK2, doesn't matter) provided by Prusa Research. The slicing for our printers is done on the computer in the Electronics Room using Slic3r Prusa Edition. Put your STL file on a thumb drive and plug it into the slicer computer. Open Slic3r (orange/grey on the side bar) and drag the file into the program. Presets can be selected on the "Plater" tab (where you see your model) on the left side. Its a good idea to chose the setting which fits your desired quality the most and make adjustments from there. Individual options can be changed in the "Print Settings" tab (e.g. support, infill, ...). All the available filament rolls should have a preset created for them, which can be selected in the "Plater" tab. If this on not the case ask a tutor for the settings. Press the "Export G-Code" button and save the file on the SD card of the printer. It's good practice to save your print files in a folder with your name. If your model requires multi-material printing, this can be done using printer P6. there is no need to sit in front of the machine all the time, just do not leave the Space! do not use acetone on the PEI sheet, it will destroy the print bed! always back up your files on your own storage, our SDs and computers might be cleaned up at any time without much warning! do not use old G-codes over and over again, but rather save your STLs and slice freshly for every print - there could have been changes to the machine since your last visit! We try to keep the cost low to allow anyone to print. Apart from the filament, we need new isopropanol from time to time. To check the amount of filament and the rough time needed for a print we suggest to use the gcode.ws online tool and analyse the exported G-Code file there. The filament amount is usually quite accurate, but the print time in reality is usually 20-30% longer on our printers. Some slicers also have built-in estimation features - unfortunately, our favorite Slic3r only estimates the required material, not the time. Prusa Research provides a list of maintenance tips.